"While this volume superficially resembles a textbook, it is a promotional tool and instructional handbook for the use of a privately-patented device, the integrated virus detection system, which promises to use centrifuging and electrospray-differential mobility analysis to quickly detect viruses and virus-like particles in laboratory settings. The author, whose connection to the patents is unclear, is a retired physical scientist who specialized in biological and chemical warfare for the U.S. Army and the Department of Defense. The vast majority of the text is highly technical. It documents various aspects of the device and the tests run on its ability to detect viruses of various types and other particles. Two final chapters look at experiments with viruses in honeybees, and pulsed-lamp decontamination as measured by the device. There are many black and white charts and tables throughout the book." Multiple viruses can be detected concurrently using the Integrated Virus Detection System (IVDS). Integrated Virus Detection describes this technology and provides many examples of applications including a chapter on viruses found in honeybees with descriptions of seasonal and yearly variation. This straightforward technology can be used to detect known, unknown, and unsequenced viruses collected from environmental and other complex biological sources. This book summarizes more than ten US patents issued for the invention of the IVDS, which is the common name of the electrospray–differential mobility analyzer method. The IVDS is powering mankind’s ability to rapidly detect, measure, and monitor viruses as well as virus-like particles. Three facts make rapid detection possible: virus size, which ranges from 20 to 800 nm. ; disparity in each virus species’ particle size thus allowing size data to be used for detection and preliminary identification; and the fact that virus particle density is distinct from other nanoparticles. 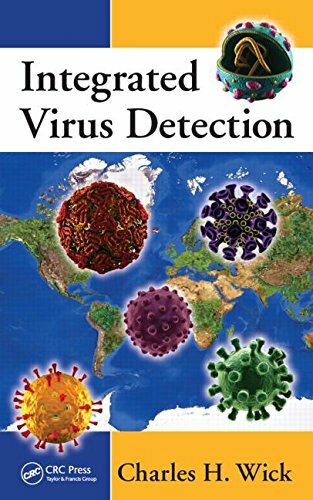 The book is helpful to anyone interested in virus detection, especially in situations where many viral types may coexist.